The rainbow, closely connected with the story of Noah, evolved into a symbol of purity, because it appears after rain has purified the air. Also, it is a symbol of hope, recalling the Biblical story of the deliverance of humankind from the great flood. And because it is white light split into its parts, a rainbow symbolized unity in diversity for a new nation. Alexandria-Washington Lodge No. 22, A.F. & A.M.
Washington was an active Mason, the rituals of which were rich in symbolism. 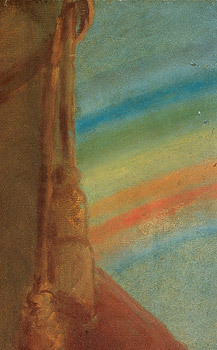 In that symbolism, the rainbow is sometimes associated with the Royal Arch, which tradition links with Solomons Temple. The Masonic rainbow is sometimes interpreted as the Arch of Heaven, supported by the pillars of Wisdom and Strength. A rainbow appears in the ritual apron given to Washington by Marquis de Lafayette, his comrade-in-arms in the Revolutionary War. National Portrait Gallery, Smithsonian Institution, and Monticello, Thomas Jefferson Memorial Foundation. Gift of the Regents of the Smithsonian Institution, the Thomas Jefferson Memorial Foundation, and the Enid and Crosby Kemper Foundation. When Washington took the Presidential oath of office in 1789, powerful monarchies ruled the world and looked with suspicion on this small country that called itself a democracy. Revolution in France would lead to war with England. Secretary of State Thomas Jefferson favored aid to France, which had so helped in Americas own Revolution. Alexander Hamilton, Secretary of the Treasury, was pro-British. Washington, sparring with both Jefferson and Hamilton, maintained a middle course. In 1793 Jefferson resigned, and Washington, who disliked political parties, found himself with a cabinet dominated by Hamilton and other Federalists. Washington had to impress on the states that the federal government was supreme. In 1794, he marshaled an armed federal force to put down the Whiskey Rebelliona revolt, centered in Pennsylvania, against a tax on whiskey, a major state export. Washingtons successful leadership through two terms as President gave the nation renewed hope and faith in its young government. He had brought the country through the tumultuous 1770s and 1780s and had established the office of the President, showing that the Constitution, with its division of powers, could work.